You can use your non-motorized craft on the main pond in Hermitage Park. Paddle boat rentals are available at Rundle and William Hawrelak Park. 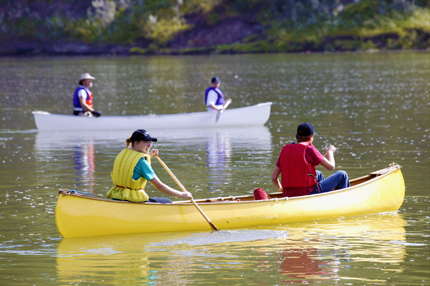 The Edmonton Paddling Centre Society operates a canoe/kayak centre on the ponds in Rundle Park for group paddling. Most of the other ponds in Edmonton's park system are stormwater lakes and are not suitable for boating, canoeing or kayaking. Be aware of the associated health risks. As users of the river, we are all responsible for its conservation and for ensuring a positive recreational experience for ourselves and others. Powered vessels must keep clear of non-powered craft. Non-powered boaters should know it is often better for motor craft to pass them at speed as this will throw a smaller wake. For public safety, any activity that may result in direct contact with water in stormwater lakes is prohibited (this includes wading, swimming, boating, fishing and skating). The City has signage posted at all stormwater facilities advising residents to keep off the water/ice because conditions are unknown. Due to the nature and the function of stormwater lakes, conditions can be unpredictable and dangerous. Moving water, temperature changes underwater due to vegetation or drainage and fluctuating weather conditions can all result in unsafe conditions not visible from the surface. The City of Edmonton maintains a trailered boat launch at Capilano Park and another at Laurier Park. These are open from April to November; depending on weather, ice, river levels and/or other debris. Temporary closures may occur due to high water or other emergency situations. To be notified of closures, subscribe to the Boat Launches Closure Notifications. Please use with caution, as submerged rocks or other debris may not be evident on the launch. Trailer and Motorized Boat Access available, parking is limited. Below the washroom building, there's a gentle sandy hill where you can access the river. Park in the lot and walk your canoe in. The dock is located to the right of the River Valley Adventure Co. down the trail when facing the River.